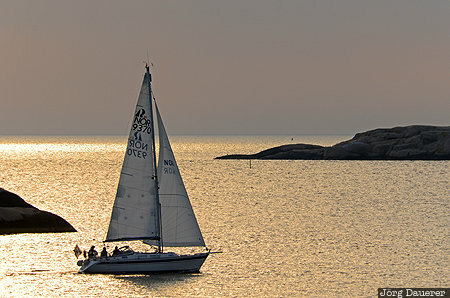 A lone sailing boat at the rocky skerry coast of the Baltic Sea near Lysekil back-lit by the evening sun. Lysekil is in Västra Götaland in the south west of Sweden. This photo was taken in the evening of a sunny day in September of 2014. This photo was taken with a digital camera.